It is time for the Winter Edition of the Bloggy Giveaway Carnvial. Hundreds of bloggers from all over the web will be offering up a variety of giveaways. 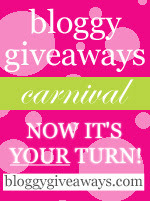 All you have to do is head on over to Bloggy Giveaways to find links to all the participating blogs and their prizes. Enter as many as you wish and you just may be a winner. This will be my first time participating. I'm so excited. I can't wait to spend hours and hours surfing blogs and entering contests. I'll be checking out the blogs while I'm there and hoping to find some new ones to add to my reading list. As soon as I heard about the giveaway I started thinking of a prize that I could give away. I finally came to the conclusion that there's no better prize for a homeschooling blog to give away than something related to school. That's just what I'm giving away: school supplies. To win, all you have to do is leave me a comment but check the small print below first. The small print: One comment per person please. Please be sure to leave your email address or have it easily accessible via your profile so that I can contact you if you win. Entries without contact information will be ineligible. The comments will close at midnight Pacific time on Friday Feb. 1st. Winner will be selected randomly and I will notify the winner by email on Saturday. Winners have 3 days after I notify them to reply with their shipping address. If I do not receive your shipping address within three days, the prize will be given to the next randomly drawn name. This contest is open to bloggers and non-bloggers alike. You must have a U.S. mailing address to win. So, what are you waiting for? Leave me a comment and head over to Bloggy Giveaways and visit the other participants. I'm always up for some school supplies. Especially the math bingo games. I love paper, pens and everything else you are giving away! Great idea!! My boybarians and I would surely get great use out of this. Our school room is getting a make over! You can see the progress in the next month at my blog. What? No dining room table? But how could we have school without one? ;) I guess I could put the rest of that stuff to good use too. Great assortment! i think my son would love the story flip cards and the scissors for sure! School supplies? What a great giveaway! Those are very useful school supplies! Always in short supply in this house! : ) Thanks for a chance to win! I love getting our new school supplies! I probably love it more than the kids do! Wow! School supplies are always a blessing in our house! I love school supplies. I could really use some of this stuff around here, and what I don't use, I know two homeschooling families that would love to share with me. Fantastic giveaway. Please enter me and my kiddos. My email can be found via my blog profile. Thanks! Oh this would be so cool to win, thanks! Okay... this homeschooling mama could sure use this!!! Please enter moi! This is an awesome giveaway. Count me in. What a great giveaway, please enter me. thanks. We homeschool and this would be wonderful to win! Thanks for offering this giveaway. Please enter me. Great contest. Such useful items. Thanks. We can always use more school supplies. Thanks for the chance to win! Oh wow, we are always needing these items. I can always use more school supplies. Please pick me! Well, as a fellow homeschooling family - we can definitely always use additional school supplies! What a fun idea! Yeah school supplies! They are always needed no matter what. My step daughter just asked me yesterday to stop by and buy loose leaf paper on the way home from work because she was out. I could really use those supplies! I don't know what my son does with his supplies, but we go through them so fast, it isn't funny! This is a wonderful and useful gift! Thanks for offering it! Considering my kids eat their supplies (or at least that is my way of explaining what they do with all of them) this would be a great addition to our homeschool. As a homeschool mom, my eyes aboutjumped out of my head! What a great idea! You can never go wrong with school supplies. Thanks for sharing. I love a freshly sharpened pencil and clean paper. Oh this would be so appreciated by us! Ohhh, we're homeschoolers too! You know how often we go through supplies?! I need more! lol Wonderful giveaway. Oh this is AWESOME.I would love to win this!!! What a clever and useable giveaway! Thanks so much for doing this! We can always use this! Thanks for the contest! That's a great prize package! Now that is what I am talking about! Please include me in the drawing! I have always loved school supplies -- it's probably what I miss most about being a student! yay! always need school supplies! great giveaway! please throw my name into the hat too! good luck everyone! Good stuff! I will have to come back and check your blog out again. Thanks! This would be great to have when my granddaughter comes over to play. Thank you! Please count me in! We can always use school supplies, and my DS would love the math bingo games. Thanks! I just took my dd out of public school and we could really use some supplies!!! Oh, I could use that!!! Thanks for the chance to win such a neat prize. While my children attend public school, I do have 4 of them, and the costs of supplies add up. So this would be most helpful! WOW what a cool contest, please enter me, thank you. This looks great! My boys would enjoy using them. Thank you for offering. as a hsing mom i can;t pass this one up!!! I love getting new school supplies. There is something amazing about new notebooks and pencils. Thanks! My school supply drawer is getting a little light! This would fill it up nicely! What a great gift, especially since we am just starting the homeschool journey. Oh, what a wonderful giveaway! Thanks for the chance. I just started college back this semester and Im low on evertyhing so that would be amazing! Count me in please! We always need school supplies! I'm planning on homeschooling my oldest DD this fall for kindergarten. Some of it she can use right now; the rest would be very handy this fall. Thanks for the chance to win. There's always a need for school supplies. What a great and creative prize package. Please count me in the drawing. Thanks. Shout out from Portland, OR! I saw that pencil sharpener and nearly drooled. It's that bad. I like school supplies THAT much. Great contest, I would love this. Yay homeschooling! Thanks for the contest! This is an awesome giveaway! Although I teach public school, I'm a homeschooler at heart and have much respect for those who do! Please stop by and enter my giveaway too! Oh this would be awesome!!! I need all of those for our school room. Enter me! This could really help out! Oh-la-la! What a beautiful site! Thank you. I love school supplies! They excite me even more than post-it notes and gel point pins! What a fun giveaway! I homeschool two of my three! I'm such a school supply geek... I just love getting new notebooks and pencils! Ooh, we can always use more school supplies! Thanks for offering such a generous giveaway, and thank you for the chance to win! Wow! Super giveaway. All these items would come in handy for our homeschool. I homeschool & think this is a great prize. Thanks for the contest. I could use this for all of my students who can't afford supplies. awesome! please enter me. I would love to win! Great giveaway! We homeschool and could always use these items. I would donate these to my church. Great idea! Please count me in! jSchool supplies are always helpful! Thanks! School supplies are perfect. It is amazing how fast we go through these products! Thank you for you having such a generous giveaway! I would LOVE to win! This is so nice and thoughtful, I would certainly enjoy it. Thank You! Pretty cool kit!! I want it!!! As a homeschooling mom, this kind of prize always comes in handy! Please enter my name. Could always use the extra supplies!! With my two girls I can never have enough supplies!! please enter us in your awesome contest!! we would love to win!! We can also use school supplies! Please enter me! This is a great give-a-way! Count me in! Who couldn't use more supplies? Please enter me. Thanks! Just the perfect supplies, thanks for the giveaway! Wow great giveaway. We are in our first year of h.s. This would be absolutely great to win! Awesome Giveaway! Perfect giveaway. We are always needing extra supplies at our house. Oh, this would be perfect for my homeschooling kiddos! Please enter me! thanks! This is so great! I'm always losing all of the homeschooling stuff... haha! Please sign me up! This would be a God-send for trying to get my 5 yr old up to speed for Kindergarten in the Fall! You can never have enough paper. And the story starters flip books sound cool. I'm a teacher I always need school supplies.